Situated at 400 mts steep uphill from Plaza España and at a few minutes walking distance from the beach and the bus terminal, in a little side street of the old town. Quiet location. A little groceries is at 150 mts distance. 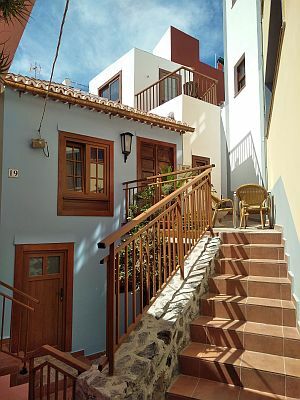 This typical Canarian house of two storeys (approx. 40 m2), has been completely rebuilt respecting the canarian architecture in 2018. On the first floor there is the bedromm with double bed and seating corner with flat screen satellite TV with radio, free Wi-Fi and rental safe as well as the the fully equipped kitchen with microwave and the bathroom with shower. On the second floor there is reading corner with seaview and a little terrace with panoramic view over Santa Cruz and the sea. The entrance patio in front of the house has a little furnished terrace as well, below you find a washing maschine for shared use. The price includes final and weekly cleaning with change of linen and towels, every guest has his own key. Minimum stay 5 nights.